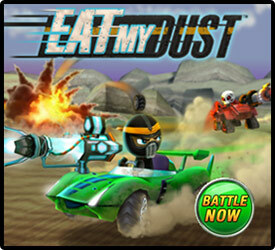 Eat My Dust is a 3D multiplayer world that combines racing, combat, and zombies into a team-building and fun competition. Created in 2007, Eat My Dust divides players into two teams, the Dragons and the Scorpions, and puts them in a head-to-head competition to see which team can drive faster and kill more zombies. Eat My Dust focuses on younger teenage males, although the world is open to everyone. All players start out with a basic car that they can customize and upgrade as they earn more coins by completing more races and battling more rivals. 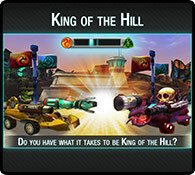 With more upgrades, players can win more races and earn even more coins. Players can also upgrade their guns and ammo, which they use to defend their team’s turf and ward off the zombie invasions that plague the Eat My Dust world. Not only can players race on pre-made tracks against other players, but they can also create their own tracks to challenge their friends on. 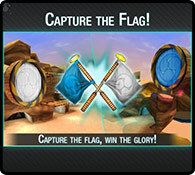 Take on your friends and test their mettle by playing a rousing, combat-filled game of Capture the Flag with other players. Fully monitored chat system so players can talk with their friends and teammates. Eat My Dust is a racing, shooter, and multiplayer game all wrapped up into one immersive 3D world. 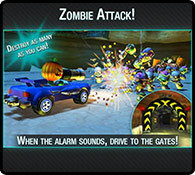 It combines the skill of strategy with the fun of blowing things up in a safe environment for players of all ages.